Of 2,200 residents of Chiang Mai, Thailand, who were polled by the city’s university, over 80 percent were highly displeased by the behavior of Chinese tourists. Common sources of complaint—spitting, talking loudly, cutting lines, and even urinating and defecating in public, sometimes sacred, places. Several years ago, a teenage schoolboy from Nanjing etched his name, Ding Jinhao, into a 3,500-year-old piece of Egyptian art on display in a temple on the banks of the Nile River. In 2013, he was widely shamed by Chinese netizens and his parents apologized to the Egyptian people. The habits that spark outrage from embarassed Chinese netizens and foreign observers alike are not limited to foreign travel—the Chinese start by disgracing their own tourist locales. Though Chinese authorities are now showing increasing concern over such trends, a few decades ago, in the 1960s and 1970s, young Chinese were encouraged by the communist regime under Chairman Mao to actively oppose the so-called Four Olds, among which was included Old Culture. Individuals were encouraged to act coarsely and violently lest they face criticism. The abandonment of the traditional morality for which pre-revolutionary China was known, including modesty and propriety, is widely believed to have contributed to today’s dearth of civility. At the temple of Marquis Wu in Chengdu, southwest China, the words “Lu Peiguo was here on April 30, 2015” were found carved on an ancient stele, according to the West China City Newspaper. The incident, not the first of its sort, resulted in an uproar on Chinese social media sites and tightening of the temple’s security, but “Lu Peiguo” has yet to be found. Flora and fauna are also frequent victims of abuse. 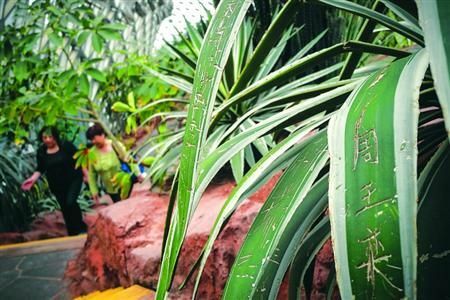 Visitors to Shanghai Chenshan Botanical Garden carved their names into the leaves of precious plants, the Shanghai Morning Post reported on May 12. Some 40 aloe and agave specimens, with thick, sturdy leaves, were vandalized in this way using keys and pocket knives. Staff have reported a recent increase in such behavior, and fear that it is becoming more popular. In mid-April, a new museum of natural history was opened in Shanghai to an initial audience of tens of thousands, with 45,000 visiting during the May 1 Labor Day weekend. Within three weeks of opening, a number of starfish on display in petting zoos had died as a result of visitors removing them from their pools to use for photos, despite rules to the contrary. 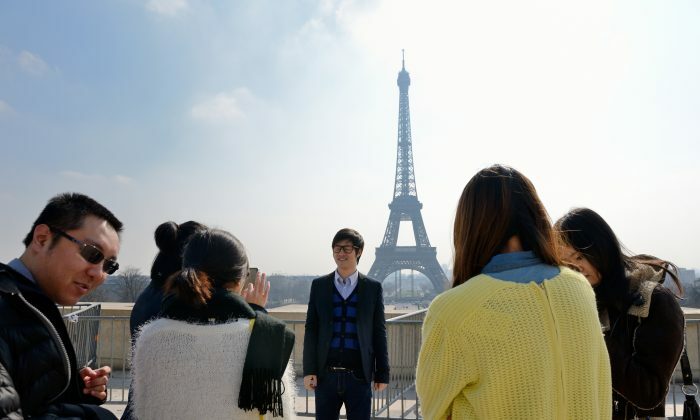 Chinese authorities recently began recording incidents of bad tourist behavior and adding them to a public “blacklist” to warn the general public. The first of these lists, published on May 7, singles out three cases—threats made to a Thai flight attendant, the unauthorized opening of an emergency door on a flight from Kunming to Beijing, and ironically, the case of a Chinese tourist sitting atop statues in Shaanxi Province depicting communist heroes.